This month, we’re exploring turbulence. You may have noticed turbulent fluid patterns in the steam coming off of your cup of tea, in the wisps of clouds in the sky, your breath on a cold day, or in the water as a wave recedes from the beach. Turbulent patterns are characterized by vortices that form on multiple scales. These patterns are present around us all the time, but it’s only when something else makes them visible that we are able to see them. And then even when they are visible, we don’t always pay attention to the fine details in the world around us. 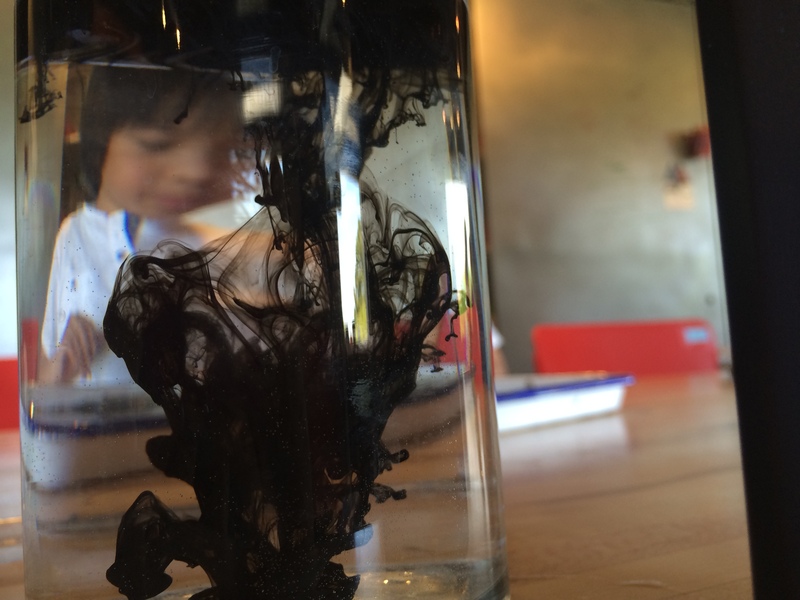 We created turbulent patterns today by dropping ink into water. Similar to clouds in the sky or foam on the beach, the ink allows us to see the movements in the water that we might not otherwise see. We explored the difference in movement in hot and cold water, and noticed what happens to the patterns when we place obstacles for the water to flow around. What other examples of turbulence can you find in your everyday life?